Do you want to dress like Madhubala? I love Madhubala saris. They are fancy chic and stylish. Madhubala - Ek Ishq Ek Junoon is one of the most popular shows on Colors. The hot actress Drashti Dhami aka Madhubala is playing the role of Madhubala in the show. She has already appeared in many advertisements, music video, and other popular TV shows like in Dill Mill Gayye, Geet hui sab se parayi. Madhubala Sari’s are gorgeous. Her saris have a tint of tradition with a perfect blend of contemporary style. She wears fabrics like georgette, chiffons and crepes that flatters her body. She loves to wear colors like wine red, bright yellows, whites and blacks. Her saris has an amazing hand work of light sequin, beads, and stone work. She is spotted pairing them with very chic backless blouses. Her necklines are also quite stylish with halter, noodle and Dooris. Most of her casual scenes she ties her hair in a long braid and for formal fancy scenes she just keeps her hair open. You can find similar chic sarees and Salwar Kameez at leading online store Cbazaar. Cbazaar is an official fashion partner of Punar Vivah. 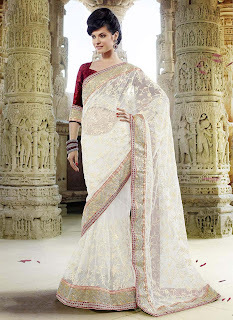 Check out similar designer sarees on Cbazaar. Cbazaar also deals in designer saris and designer lehenga choli at the leading online store. Cbazaar also helps you to buy traditional outfits online for festivals. Cbazaar offers attires that reflect a perfect mix of creativity, aesthetic design and comfort.